On January 8, 2009, the United States Central Command created Combined Task Force 151, a multinational headquarters directed at "counter-piracy operations in and around the Gulf of Aden, Arabian Sea, Indian Ocean and the Red Sea," a previously declared Maritime Security Patrol Area. First commanded by RADM Michelle Howard of the U.S. Navy, CTF 151 is now commanded by the Turkish Navy. The command staff, led by RADM Caner Bener, has personnel from Turkey, the U.S., U.K., Pakistan and Greece. VADM William E. Gortney, U.S. Navy, commanding the United States Fifth Fleet and some of the multinational maritime forces in the area, was responsible for overall maritime security. Some navies in the Area did not have authority to conduct counter-piracy operations, so they can continue general security operations while Combined Task Force 150, CTF 151 and Combined Task Force 152 focused on counter-piracy She simultaneously commanded, and continues to command, U.S. Expeditionary Strike Group Two. TF 151 has components from navies including Denmark, Turkey, Singapore and the United States. It complements a separate European Union maritime security force; Denmark chose not to participate in the EU command so joined TF 151. CAPT Dan B. Termansen, commanding the Danish "flexible combat support ship" HDMS Absalon, alone, had found 88 suspected pirates as of the week of March 15. 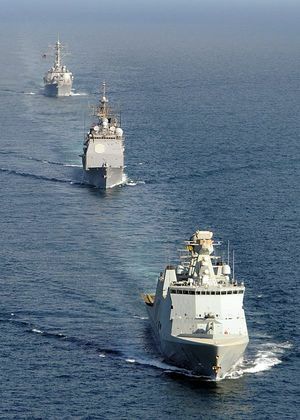 In addition to the EU force and TF 151, ships from other countries, including Russia, China, and India are cooperating although not under common command. While the Danish ship is returning home after a deployment, a task group from Singapore is joining TF 151. The Turkish frigate TCG Giresun (F-491) joined TF 151 in February 2009. This page was last modified 10:14, 13 August 2010.